Quality Plastic Extrusion by Crafted Plastics Inc.
Total Quality Management is used to ensure our ability to thrive in the increasingly competitive marketplace; we are committed to meeting the production and plastic extrusion requirements of each customer. We provide a quality plastic extrusion product on time and at a reasonable price, which equals value...the ultimate goal of our Total Quality Management Program. We've acquired the internal knowledge and resources necessary to implement TQM's continuous process improvement principles ... improvement for the long-term. Our quality assurance and in-process inspections mean our customers can expect manufacturing precision and product integrity in every plastic extrusion we produce. From management to production, engineering to safety, sales to packaging, we've assembled TQM teams throughout the company, all working together for continuous process improvement in everything they do. And at the core of these teams are our employees...employees who proudly participate in providing each customer with the highest possible quality products, delivered on time. Experienced staff, combined with an extensive inventory of production and quality test equipment, guarantees a high precision custom extrusion plastic product that meets the customers' specifications. 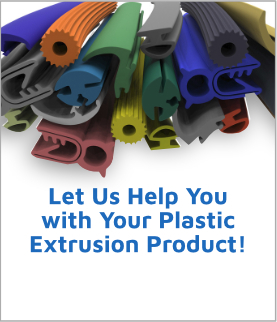 Contact Crafted Plastics Inc. for all your extruded plastic needs!